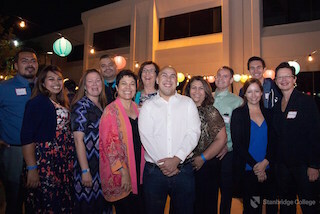 On a cool June evening, under the glow of colorful paper lanterns, Stanbridge College alumni gathered for a night of fun – seeing classmates, enjoying tacos, and simply being back at the school that has meant so much to them. 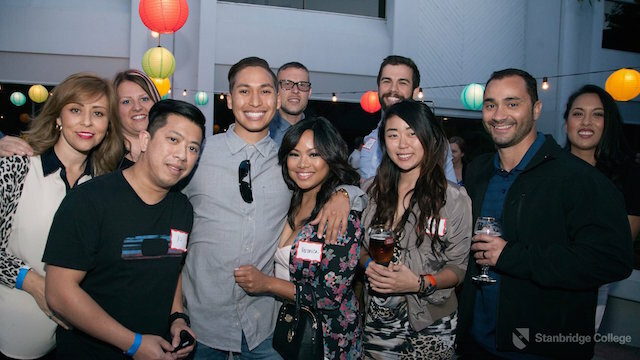 As guests arrived, exclamations of joy could be heard amongst various groups, as these busy professionals found time to catch up with friends they’ve missed since leaving Stanbridge. After speaking about recent innovations on the Stanbridge campus, including the world’s first high-fidelity canine patient simulator, Mr. Weerasuriya announced exciting news of the upcoming partnership between Fordham University and Stanbridge College, during which Occupational Therapy students will assist with research for a project benefitting the manned mission to Mars. Alumni had a blast taking part in a series of games including trivia and icebreakers, which rewarded those “in the know” with a chance to spin the prize wheel and take home some cool Stanbridge spirit gear. As the speakers blasted hits from Motown to Top 40, many hit the dance floor, happy to show off their moves, and end the week on a joyful note. With the evening winding down, alumni savored their last bites of dessert and collected parting gifts– small reminders of the place that is proud to count such accomplished individuals as part of its community.